"In our experience, the client finds it very reassuring to know that two lawyers are familiar with his case." Wolfgang Strba goes by the motto that you can only understand and assess others after having talked to them – preferably personally and not in a rush. This applies both in his private life and even more so in his professional life as a lawyer. We take him at his word and ask him about the normal day-to-day life at the law firm, and why discretion is imperative in his profession. Question: Mr. Strba, you are a lawyer – what exactly is it that you do? Wolfgang Strba: We see ourselves as service providers in the best sense of the word. For instance, we advise our clients on drafting contracts and support them in negotiations. This includes the purchase or renting of real estate, the termination of an employment contract, the formation of a company, to name just a few. An additional, substantial part of our work is litigation in all areas of civil law and employment law. Question: This sounds as if your work is very versatile. Wolfgang Strba: That’s correct. We always need to see the client in his very specific individual situation. In this respect, legal issues can never be considered in isolation, there is always also a very unique personal and economic background to each case. Everything needs to be assessed in context. In each case we first have to diligently investigate the facts and ask ourselves: What exactly has happened and what does the client want? What approach and procedure is reasonable – also from an economic point of view – and is the solution that is tailored to the client’s specific situation? What would we do or expect if we were the client? How can we do justice to the trust our clients place in us and our work? Question: How do you win your clients’ trust? Wolfgang Strba: With the most important qualities of a good lawyer: Diligence, competence, and discretion. For example, we never advertise the size or importance of any clients to grab attention in the press. A lawyer should keep a low profile, exclusively take care of his client’s interests, and not try to make a name for himself at the client’s expense. We are very conservative in this regard. We appear in public only in a professional context, for example by regularly publishing a column in the Frankfurter Allgemeine Zeitung on employment law issues. Question: Let’s get back to your law firm. What is a normal working day at your office like Do you work more at your office or outside the office? Wolfgang Strba: We primarily work here at our office. Of course we also attend court hearings and handle mandates throughout Germany. However, modern means of communication enable us to easily advise our national and international clients from here. Frankfurt is a place that can be easily reached by clients. Question: Do you sometimes visit clients? Wolfgang Strba: This is actually often the case. First, it is a matter of courtesy, and second it is often more efficient for our clients – especially for companies, as all relevant documents are easily accessible. Whenever the managing director needs a specific document, it can be provided at once. Employees can also be involved at any time for answering further questions. A further advantage: We get to know people in their own environment and gain an understanding for what they are doing. Question: Personal contact is important to you. Why? Wolfgang Strba: As a rule, the issues are so complex that all important aspects can be worked out only in intensive discussions with the client. Only when we have clearly identified the problem can we find the legally sound and practicable solution which is economically reasonable and satisfactory for the client in the long term. An out of court settlement, for example, is often preferable to legal action, as it is more cost-efficient and quicker. However, it is the client who decides. If legal action is necessary, we are steadfast and resolute in representing our clients’ interests. All this sounds simple and obvious, but can be achieved only with a high level of commitment in terms of personal dedication and time. It also requires our client’s cooperation in closely coordinating the procedure. We never make unrealistic promises; everything is handled in a transparent and comprehensible manner. We never send any letters without our client’s approval. The client sees what we are doing and thus always knows exactly what he is paying for. We are always available to our clients, in urgent cases also in the evening or on weekends. Through our commitment as well as thorough and systematic approach we are always well prepared and thus often one step ahead of the opponent. Question: Do you also give advice over the telephone or online? Wolfgang Strba: No, we do not think much of that. We only give advice on the phone to clients who we know and within the context of a mandate. For example, we have clients in France, the USA and Great Britain who operate in Germany, but of course cannot come here every other day. They therefore send us their documents, and we then advise them on the phone or via email. On principle, we do not render any “low budget” telephone advice for a couple of euros per hour. This does not meet our standards. Question: Could one say that legal success depends on the objective consideration of the facts? Question: Your clients expect you to help them. What do you expect from your clients? Wolfgang Strba: We expect our client to openly and constructively cooperate with us. This means that he tries to gather and sort the necessary documents. And—another important point – he contacts us and provides the documents as early as possible. Early involvement of a lawyer can frequently prevent later problems and costs. Question: What kind of clients come to see you? Wolfgang Strba: Our client base is much diversified. We represent individuals and enterprises. We often also act on behalf of fellow professionals mandating us with their matters. In employment law cases, for example, the fact that we represent both employers and employees or works councils is useful for us and the client. Good advice can be given only when the lawyer can also understand and assess the position of the adverse party and includes such position in his own considerations. Question: How do you acquire clients? Question: You often follow the “four eyes principle”. Could you please briefly explain what that means and especially the advantages for clients? Wolfgang Strba: In our experience, the client finds it very reassuring to know that two lawyers are familiar with his case. We then conduct meetings with two lawyers, so that the client gets to know both and then knows that he can always reach a well-informed lawyer. Something might turn up in his case and the contact person in charge is not available right away. The four eye principle, i.e. the second lawyer, prevents this problem. Moreover, this enables us to clearly increase the quality of our work. Four eyes simply see more than two. The two of us then also work together, discuss the cases and exchange ideas. This enables us to better prepare for proceedings, as we can take different positions to review and optimise our strategy and to better prepare our line of argument. Question: Back to your law firm. Is the firm independent? Wolfgang Strba: Yes, we are independent. Question: What’s the advantage for the client? 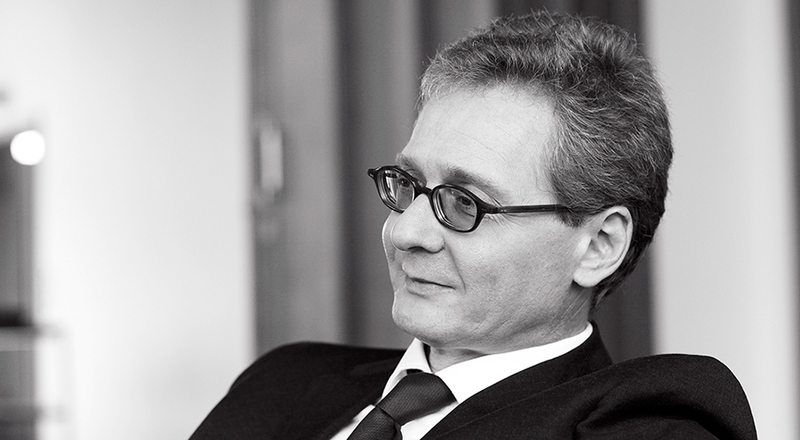 Wolfgang Strba: The client can be sure that we are committed solely and exclusively to him as our client. The client is our principal. He is the person who ultimately decides where we are going. We are not afraid to act in his best interest both emphatically and resolutely, also against large companies, authorities or institutions, . Question: What do you appreciate in your colleagues? What is different at the law firm Strba? Wolfgang Strba: All of us are highly qualified and committed. We are continuously developing and furthering our legal expertise by attending seminars and conferences. We enjoy working together, and have experienced and gone through a lot together. Each of us is a very unique personality – but there is a common denominator: We all have a high level of personal integrity and share our interest in exercising our profession with joy and passion. Our clients’ positive feedback is our driving and motivating force. Question: Do you take on every case? Wolfgang Strba: No, we only take on cases which we can handle with professional competence. Whenever we are contacted in a matter where this would not be possible, we recommend other offices. The same applies when we cannot professionally deal with a case for lack of time. Anything else is unreasonable. Each client wants his case to be the most important on his lawyer’s desk. This is entirely understandable and just as it should be. Last question: Your job can be highly emotional. How do you take your mind off your cases and relax? Wolfgang Strba: I am very lucky. I have a family – and a big dog. Mr. Strba, we thank you for this interview.